We are NOT selling cards. These prices are compiled for clarification of relative values and what you might expect to pay at a game store or eBay. Some prices were left blank on purpose. 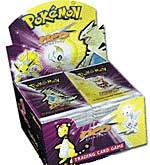 Uncommon cards generally go for 50 cents to $2. Commons are usually just worth pennies up to $1. Exceptions to these rules have had prices inserted for them. PSA Graded Cards are usually worth considerably more, especially if graded PSA 9 or 10. Two different PSA 10 First Edition Shining Tyranitars sold for $875 each on EBay in 2017. A PSA 10 Shining Charizard sold for $975 on Ebay in 2017.